Homespun Stitchworks..... For the love of vintage: Stitching tiny samplers ....... with tiny wee stitches. Stitching tiny samplers ....... with tiny wee stitches. there lived a tailor of Gloucester...... no more twist! 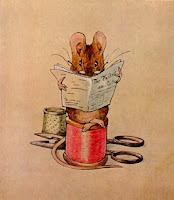 Beatrix Potter .. The Tailor of Gloucester. 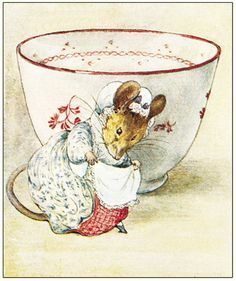 The above not only happens to be from one of my most favourite children's books and was a great favourite along with the most beautiful artwork but is how I am feeling ... like a mouse with tiny wee stitches! I have embarked on a set of tiny little sampler pictures and It is great fun and I am loving doing it with wee tiny stitchery and very good light when I can get it on these very dark February days we are having. Small bit of vintage linen, beautiful hand dyed shaker thread, vintage mother of pearl buttons and small vintage notions along with tiny scraps of beautiful vintage fabrics and tiny little neat embroidery stitches ..... that is me right now.The book its self has inspired me as well and I am in heaven designing and stitching these beauties. 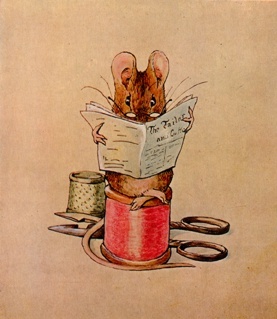 Luckily I am not going to have the same problem as the tiny mice in the story with no more twist! sorting through my stash of hand dyed threads the other day, I discovered I have er ... quiet a few! so that will not be a problem at all. I am loving designing them and stitching so quiet happy sat with a tiny embroidery hoop and watching from the window this dreadful weather we are still having. I have to sort through later or maybe before I start my stitching, a large box of ribbons and vintage monograms and lace .... I want to add things here and there. Well I must away to start my day. Whatever you are doing have a great day and as always..
a table, from morning till dark. I love your piece of embroidery. I would love to have a go at work like that, I hope you don't mind. Over the years I have inherited and collected and become the guardian of pieces of fabrics vintage and modern and buttons from my mother and grandmother, I think I'm the one who needs to use them before they are lost forever! Julie you should have a go and make something lovely. The piece that I have shown is part of a collection and I was naughty showing it ... going to get my knuckles rapped for it but hey.